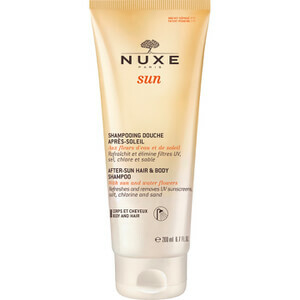 The Face and Body Delicious Lotion from NUXE provides sun protection from harmful rays and prevents signs of premature ageing. Its unique formula with sun and water flowers helps you achieve a natural, even tan and leaves a silky smooth finish on the skin's surface, without making you feel greasy. Enriched with nourishing and hydrating ingredients, the water-resistant sun lotion delivers an uplifting fragrance with notes of sweet orange, Tahitian Gardenia and vanilla. E.N.